Throwback Night, Special Giveaways & More in 2019! The Bats will celebrate their 20th season at Louisville Slugger Field with special giveaways and promotions all season long. 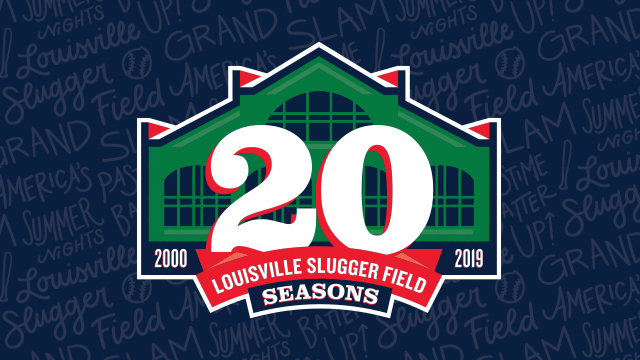 LOUISVILLE, Ky. - The Louisville Bats are excited to announce that the 2019 season will celebrate the organization's 20th season playing at Louisville Slugger Field. Special giveaways, promotions and more are planned at the ballpark throughout 2019. The Louisville RiverBats opened the inaugural season at beautiful Louisville Slugger Field located at the corner of Preston and Main in Downtown Louisville in 2000, the same season the RiverBats began their partnership with the Cincinnati Reds as their Triple-A affiliate. Louisville won the Governors' Cup that season, defeating Scranton/Wilkes-Barre to capture its first-ever International League Championship. The RiverBats dropped the 'River' from their nickname to become the Louisville Bats in 2002, and the name has stuck ever since. In 2008, Louisville Slugger Field hosted the Triple-A All-Star Game. In 2016, the ballpark was named "Best Triple-A Ballpark", edging out 29 other candidates in a voting contest by Ballpark Digest. On April 21, 2018, Louisville Slugger Field set a new attendance record for a sporting event, drawing 14,658 fans for "Thunder At Slugger Day"
A logo featuring an animated Louisville Slugger Field graphic will be featured throughout the 2019 season in publications and giveaways all season long. The Bats will turn back the clock to their Louisville RiverBats days, wearing special throwback RiverBats uniforms as part of "Throwback Weekend", which will take place Friday, July 12 and Saturday, July 13 against the Toledo Mud Hens. As mentioned above, Louisville will become the RiverBats for a special two-game stretch in mid-July. RiverBats t-shirts and hats will be for sale in the Bats Team Store starting July 12. Special giveaways during the weekend include a 20th Season Poster giveaway on Saturday and a RiverBats t-shirt giveaway on Sunday. Many people have made the Bats' 20 seasons at Louisville Slugger Field so memorable and special, and one individual that Louisville is going to recognize is the "Cookie Lady", Elizabeth Kizito. Since the ballpark opened, Kizito has put smiles on the faces of so many baseball fans throughout the years with her infectious enthusiasm and delicious cookies. The Bats will be giving out the "Cookie Lady" bobblehead to the first 2,000 fans on August 2 vs. Toledo. The Bats have other special giveaways and events commemorating the club's 20th season playing at beautiful Louisville Slugger Field, including Buddy's Birthday Bash, which will include a Buddy Bat Plush Doll giveaway. For more information and a full list of the Bats' 2019 promotional schedule, visit batsbaseball.com.